Fact or Fiction - Truth or Tradition? In the video below, Pastor Greg Boyd contrasts the current traditional belief in a “Hell” where sinners are tortured forever with what the Bible actually states about the place called Gehenna; the place where God, in His love, utterly destroys the unredeemed. God witholds His gift of everlasting LIFE and the wages of their sin is literally and simply DEATH (Romans 6:23). After several years of studying the Bible extensively on various topics including this one (i.e. Hell), we are very encouraged when we find others who come to the same conclusions. If you listen to part 2 of Pastor Boyd's message, you'll hear him talk about how it is not always a bad thing to question what you've been taught. In fact, he says that questioning and wrestling can actually be a sign of your faith. We should always see if what we believe is derived from biblical truth or man-made tradition. The more we've studied, the more we've learned how far removed Western Christianity is from Biblical Christianity. Perhaps after viewing this one message, you'll get an idea of what we mean. - Be Blessed! I received an e-mail this week saying the upcoming election is the scariest election Christians have ever faced and I have heard similar talk in the mainstream Christian realm. I am blogging with the hope of Biblically debunking this type of propaganda-like talk that promotes unnecessary fear and paranoia. God’s Word makes it clear that His Children never need to worry about the politics of the world because our Father is ultimately in control. Daniel 2:21 says that God raises up kings and removes kings and Daniel 4:17, 25 & 32 all say, “...until you know the Most High rules in the kingdom of men, and gives it to whomever He will...” With this truth in mind, why should I be scared about who our next president will be? If there is a particular candidate I think might do a better job than another, I still realize that Satan is the god of this age and therefore, has his influence on worldly governments and their leaders (2 Cor. 4:4). Even so, God orders the powers that be and it is my responsibility to obey those leaders, pray for them and not speak evil of them (Romans 13:1; 1 Tim. 2:1-3; Titus 3:1, 2; 1 Peter 2:13-19; Jude 8). And whether our next president is a democrat, republican or a third party candidate, he/she cannot prevent me from loving God with all my heart and loving my neighbor as myself. My main exhortation is this: Let us not allow a presidential race distract us from the REAL race and prize at hand (1 Cor. 9:24, 25) and let us not be guilty of placing our hope and trust in politicians rather than the LORD. First off, Dennis graduated from the FAA Academy after almost 8 weeks of vigorous training! We're thanking God that he made it through and now he'll start work at the Dallas/Fort Worth International Airport on Monday (Sept. 15th). I thought I’d blog about our summer in Oklahoma City (OKC) for those who may want to know what all we were up to. On the above map, you can see OKC is in the middle of the state. Directly south of OKC, where all the interstates intersect, that is where the Dallas/Fort Worth metroplex is located. So you can see it was quite an easy commute for us. While our time in OKC was strictly business for Dennis, it was like a long summer vacation for the children and me. We stayed in an extended stay apartment complex in the city of Moore, but on the border of Oklahoma City (only 15 minutes from downtown). As far as Moore’s claim to fame, the nearby water tower brags “Home of Toby Keith” (perhaps that means something to any country music fans out there). Our apartment complex was very family-friendly with sweet little ladies working in the office, a pool, playground and a community dinner on Thursdays --- where we would go to the office building for dinner prepared by the people who work there. We also met all kinds of people from all over the country (and even a family from India). It was enjoyable for me to talk to different people and for the children to have little playmates. At the academy (Mike Monroney Aeronautical Center), Dennis ran into people he worked with at McConnell and Dover Air Force bases. Our “adventures” around the city included regular trips to the Moore Public Library, a picnic at the Stanley Draper Lake, getting wet at a sprayground (see photos below), and a visit to the National Memorial where the bombing took place at the Alfred P. Murrah Federal Building on April 19, 1995. We took 3 trips to the wonderful Oklahoma City Zoo - thanks to Retro Wednesdays through August where it was only 75 cents for admission. And it is a very nice zoo – I can see why it is ranked the 3rd best family-friendly zoo in the country! Our last few days in OKC were a bummer because the children and I all got sick – probably from all the germs at the library lol! It was also very rainy the last few days so I guess we wouldn’t have been able to do anything anyway. I felt bad for the little ones because they didn’t get to play with their friends much those last few days (a 6-year-old boy from India and a 13-year-old boy and his 8-year-old sister from West Virginia – who were so sweet with our young children, by the way). Below is a slideshow of pictures from our time in OKC --- taken by me, not from the Internet this time. Enjoy! You Could Learn A Lot From A Stroller. Hello from Oklahoma City! We arrived here Tuesday, July 22 and I intend to blog soon about our adventures in this lovely city. For now, I wanted to share somewhat of a testimony about God’s goodness. This story revolves around a stroller, which I acknowledge is not important at all in the big scheme of life, but I feel it is worth sharing because of the lessons involved. I suppose this testimony began back in PA when we were getting rid of most of our possessions. One thing I really wanted to hold on to was a Graco double stroller that a relative picked up for us back in 2005 for only $5. I used the stroller a lot which is why I wanted to keep it. However, it was kind of bulky and since we were trying to get down to the bare minimum, I knew it was not a necessity and gave it away on Freecycle. Once we settled in Hurst, I started to have an itch for a double stroller again. However, after having one that was only $5 and seeing other good deals in the past, I really had it in my heart to pay no more than $20. In June, our family went to a midnight madness sale at the local Goodwill where everything was 50 percent off. Dennis immediately spotted a very nice Eddie Bauer double stroller with an infant car seat for only $40 after the discount. This was a great deal, but we had a hard time trying to figure out how to close it and we both agreed it was rather heavy and bulky. I told Dennis that I knew I would use it, but wasn’t sure about how heavy it was and the price. I admit that was a great price, it just wasn’t the $20 or under I was thinking. In the end, I told Dennis to decide and we left without it. Fast forward to this past Thursday (July 31); after taking the children out by myself a lot lately, I really wanted a double stroller ASAP. I looked online to see how much a brand new double stroller costs at Wal-Mart and the cheapest I saw was around $100. Again, not such a bad deal [and we could afford it], but I just knew I could get a better deal. As I was sitting at the computer thinking about that, I felt I should pray about it. My first thought was, “I’m not praying about a silly stroller. There are people dying in the world – who cares if I get a double stroller?! ?” But I just felt an even stronger urge that I should pray and have faith that God would answer. I tear up as I type this because it is all just unbelievable. So, I prayed a short prayer just telling God that I really didn’t think it was important, however, I really had a desire for a double stroller and I would like to get one for no more than $40, preferably $20. After dinner, I decided to check out the local Salvation Army and Goodwill for our evening outing. I thought for sure I would find a double stroller at one of those stores but I didn't. I was then tempted to buy a $10 single stroller that was much nicer than the old umbrella stroller I’m using, but felt that perhaps I would be lacking faith if I bought it since I specifically prayed for a double stroller. As I was driving home, I was kind of confused that I did not find a double stroller. I can’t explain it, but I just felt the prayer was going to be answered soon and that perhaps I simply needed a lesson in patience & trusting God. But, the night wasn’t over yet! Around 9:20 p.m., I looked up Oklahoma City (OKC) classifieds on Google. The first link that appeared was for OKC CraigsList, so I went to it and clicked on “baby + kids.” The second listing which had just posted at 9:10 p.m. was for a 3-year-old sit and stand double stroller for only $20!!! 1. A big lesson was patience. I had to be patient by not having a double stroller for about 9 months and I recently regretted not getting the Eddie Bauer stroller back in June but now, I am so glad I waited because the stroller we bought is better than any others I have seen! I never would have imagined I could get a sit and stand stroller so cheap since they cost $180 or above brand new. 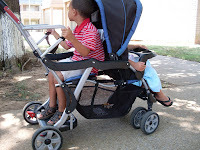 And it is perfect because the older child doesn’t have to climb in and out of an actual closed-in seat (see pics below) and overall, the stroller is easy to use and is not heavy. So, in being patient, I was blessed with something far better than I ever imagined! 2. THE most important lesson was letting go of something I loved in order to receive something better. 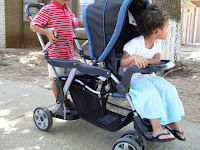 I had to let go of the Graco double stroller in order to receive the far greater blessing of a sit and stand stroller. I cannot help but think of the greatest example of letting go of something that we want to hold on to in order to receive something better: Jesus said, “For whoever desires to save his life will lose it, but whoever loses his life for My sake and the gospel’s will save it” (Mark 8:35). And not only will our life be preserved, but Jesus promised us life abundantly (John 10:10)! It may be painful to let go, but we have to trust God is faithful and will give us something far greater in return. A stroller is a silly little token, but I know the Living God can do the same with anything in life that we have to let go of. He is truly an awesome God! But of course, we cannot manipulate the Creator; Our hearts must be pure and we must delight ourselves in Him first and foremost if we are to receive the desires of our heart (Psalm 37:4). Well, our time in Laredo is over and we are now in Hurst, Texas. Dennis’ last day of work at Laredo International Airport was June 15th and we left Laredo the following day. After a pit stop in San Antonio and an overnight stay in Temple, Texas, we arrived here in the Dallas/Fort Worth (DFW) area on Tuesday, June 17th. We looked at apartments Tuesday afternoon, signed a lease Wednesday morning, shopped for furniture that afternoon and by 6 p.m. that same day, we almost had our entire apartment fully furnished! Since we sold and/or gave away nearly everything back in PA, we arrived here with only a van and a car full of belongings so we were starting from ground zero. Throw in a bunch of trips to Wal-Mart and Super Target along with the usual routine of having 3 children and we have been exhausted! We’re still getting settled in our adorable apartment/townhouse and we are so happy to have all this space, grass outside for the children to run around in, 2 pools in the complex and everything we could want and/or need within a few miles. And with being an interracial family, we are also appreciating the racial diversity in this area. Nevertheless, the traveling doesn’t end just yet. We will be heading to Oklahoma City (about 3 hours north of DFW) where Dennis will attend the FAA Academy for 8 weeks beginning July 23rd. Thankfully, we are all able to go with him; the FAA will pay him “per diem” and that will cover our stay in a 3-bedroom, 2-bathroom furnished apartment. After Dennis completes school, he will have one day for travel before having to report to work at the DFW International Airport ATCT (Air Traffic Control Tower(s)). I’ve included the map [below] so you can see where all we drove through in Texas to get to DFW. From Laredo, it was a 7-hour drive and we basically just took Interstate 35 the whole way and drove through San Antonio, Austin and Waco before hitting DFW. Hurst is about 15 minutes northeast of downtown Fort Worth and 30 minutes west of downtown Dallas. I hope from here things will calm down a bit and my next blog will be to share something other than the Dunnavilles’ travels lol! Last week, Dennis received an offer for a job with the FAA at...Dallas/Fort Worth International Airport (DFW)! He is in the process of completing all of the necessary paperwork and examinations (i.e. background check, physical, psychological evaluation, etc.). Once all that is complete, he should be given a start date either to begin working at the airport or to first attend the FAA Academy in Oklahoma City for 8 weeks. In other news: As of today, Dennis is now fully certified at the air traffic control tower here in Laredo. We are praising God for this considering all the trials he's faced! As for heading to the Dallas/Fort Worth metroplex (LORD allowing), I am looking forward to it. I am excited about going somewhere else new and about all the opportunities living in such an area. For example, there appears to be various established homeschool networks we could link up with which would mean all kinds of opportunities for the children. There are also quite a few large ministries in that area and I look forward to engaging in that arena (including Life Outreach and also Gospel for Asia - a ministry Dennis volunteered for in the past). I just pray that Dennis' job isn't extra-stressful being that he'll be working at one of the busiest airports in the world. Although, it could feel like a cakewalk after all that he has gone through here lol! Seriously though, after his interview at San Antonio, it appears the FAA is nothing like these contract towers Dennis has worked at so working for the FAA looks promising and we are hoping for the best! For more information or to order this book at a low price, click on this image.